Hepatocellular carcinoma (HCC) is the third prevalent cause of cancer death worldwide. Despite recent advances in diagnosis and treatment, HCC is frequently diagnosed at an advanced stage and has a poor prognosis. Xenograft murine models can contribute to the understanding of drug response in humans and enable the discovery of novel anti-cancer drugs. The HepG2 epithelial cell line is isolated from the liver cells of a 15-year-old Caucasian male patient with hepatocellular carcinoma. The HepG2 cell line expresses insulin and insulin-like growth factor II (IGF II) and is not tumorigenic in immunosuppressed mice. HepG2 is utilized in trials with bio-artificial devices for liver failure. A 2011 study in Cancer Biology & Therapy evaluates the combined antitumor effects of the drug combination of sorafenib and an SK2 selective inhibitor, ABC294640 using the HepG2 xenograft model of hepatocellular carcinoma. The study demonstrates that combination of sorafenib with ABC294640 reduces tumor growth in the HepG2 xenograft model. Therefore, simultaneous targeting of the sphingolipid and MAPK pathways using both SK inhibitors and sorafenib could be useful for HCC patients. A 2017 Nature study (Woodfield et al.) validated the HepG2 xenograft model as an orthotopic murine model that is appropriate for clinically relevant evaluation of hepatoblastoma (HB) that is similar to human HB tumors. They used MRI, immunohistochemical, gene expression, and bioluminescence techniques to analyze levels of human alpha-fetoprotein (AFP), beta-catenin, glypican-3 (GPC3) as well as tumor growth, neovascularization, genetics, and histology. There was also a 2016 Nature study that used HepG2 xenograft models to evaluate the mechanism of increased to HCC associated with elevated glycemic index. Results showed that high glucose levels activates Wnt signaling mediated by suppression of DKK4 expression and an increase in beta-catenin levels; this resulted in a downstream cell cycle check point bypassing and rapid proliferation. Finally, there was a 2017 article released by Li et al. that used the HepG2 xenograft model to investigate the mechanism of antitumor activity of the total flavonoids extracted from Arachniodes exillis (TFAE); observations revealed modulation of expression levels of proapoptotic proteins cleaved caspase-3 and Bax (increased) and downregulation of HIF-1alpha, VEGF and Bcl-2 expressions which supports a model of apoptosis and angiogenesis induction. 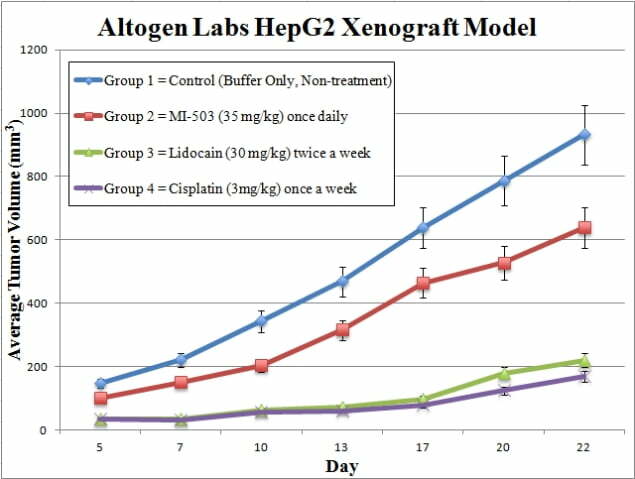 The HepG2 cell line (human liver) is utilized to create the CDX (Cell Line Derived Xenograft) HepG2 xenograft mouse model. The HepG2 xenograft mouse model of human hepatocellular carcinoma (HCC) allows for studies consisting of antiangiogenesis targeting (i.e. bevacizumab, rapamycin, etc.) or as a tumor growth inhibition model (e.g. sorafenib). *NOTE: All IP rights to the HepG2 cell line belongs solely to the Wistar Institute. The client needs to obtain a license from the Wistar Institute prior to initiation of a xenograft study using the HepG2 cell line. 1. Exponential growth of HepG2 cells are maintained prior to collection. 2. The cells are collected by trypsinizing the cells. Cell count concentration and viability is determined with trypan blue (min 98% viability). Cell suspensions are then adjusted to the required concentration for inoculation. 3. One million cells, in a volume of 100 µL (Matrigel + HepG2 suspension), is inoculated subcutaneously (s.c) via a single injection into the hind leg (NOD/SCID or athymic BALB/C, 10-12 wks old). 4. The injection areas are monitored until tumors are palpable. Calipers are utilized for tumor measurement until average sizes of tumors are 50-150 mm3. 5. After randomization (sorting) into appropriate cohorts, test compounds are injected according to the agreed upon treatment schedule. 6. Tumor measurements are recorded (daily) and mouse weights are documented (3 times weekly). 7. As tumor size limit is reached (or maximum of 2,000 mm3) the animals are euthanized. 8. Necropsy is performed at the end of the study. 9. Tumors are removed, their weights logged and the tumor is documented (digital imaging). 10. Tissues are collected from the animals (submersed in RNAlater, snap frozen, nucleic acids isolated or tissues prepared for histological analysis) by performing standard gross necropsies.